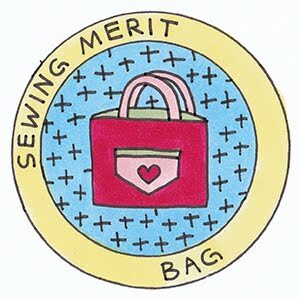 I submitted my entry to the SewCanShe SewAlong today. 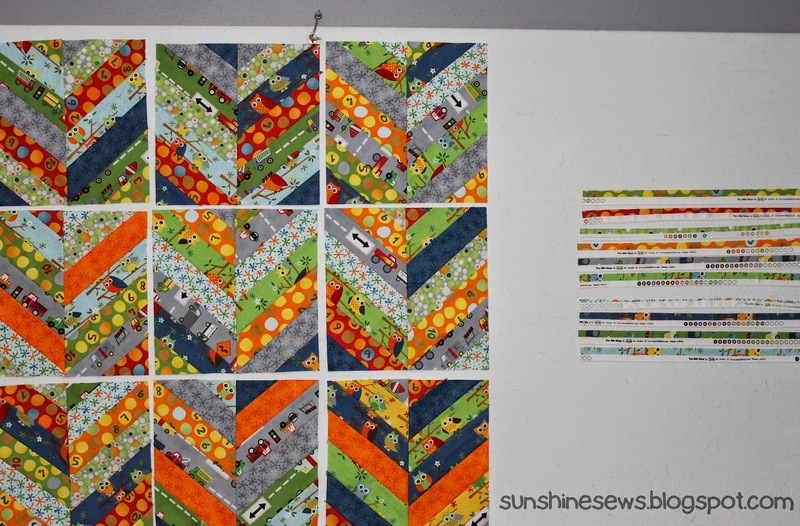 I did some modern straight line quilting to compliment the linear blocks. I also used all the left over fat quarters on the back. 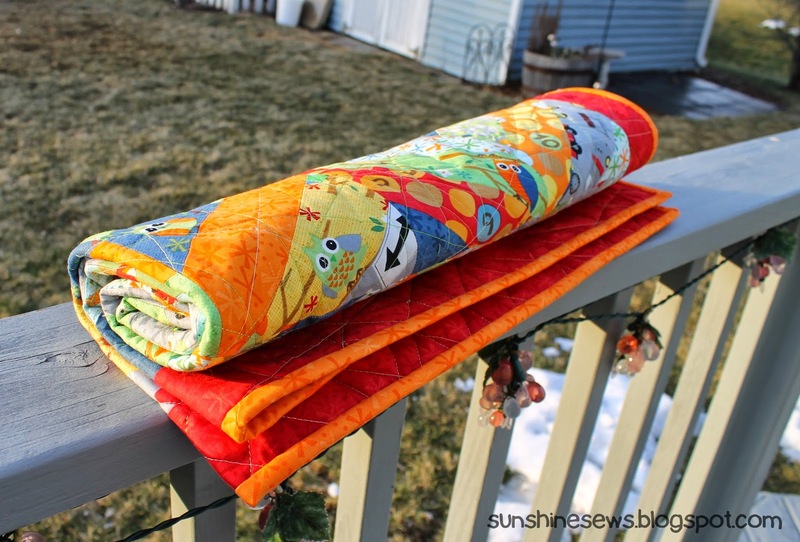 I did have to purchase another half yard of the yellow owls and the orange to have enough fabric to finish the little quilt. Not sure what I will do with this but it was fun stepping outside of my comfort zone with the cool herringbone blocks. My friend Jeannette and I attended the first meeting of the local Quilts for Kids chapter. 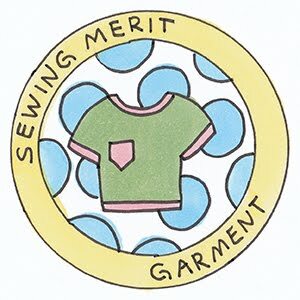 The people running this chapter seemed to know each other from their connection to the Northwest Sewing Guild. Even though things started out a little chaotic, the meeting went pretty well. 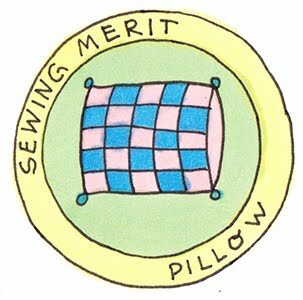 We could grab some fabric and a pattern of our choice and sew away. 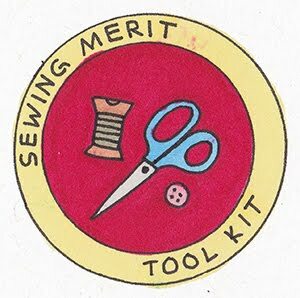 Or we could prep kits for all the members to take home to make a quilt. We chose to get the fabric and start sewing. People behind us were cutting up squares and packing them in Ziploc bags with patterns to make take-home kits while we just sewed. The leader was well-versed in the Quilts for Kids organization. I was glad to get some history regarding how the group started. They are older than Project Linus and the main take-away I got was that they only make quilts. And when I say quilts I mean machine-sewn, machine-quilted items. No hand-sewing, no knitted or crocheted afghan-like blankets and no fleece. These items are meant to hold up and wear well for repeated washings for kids who need them to wear well. They also provide fabric! The headquarters will give out fabric when needed (of course the guild uses the fabric as feature squares and they like the members to add their own fabric to the mix). That sounds easy enough. So as we sat sewing and chatting, the group was a little noisy with everybody chatting and sewing or cutting. But it was fun and it was wonderful that we could be individually creative or be part of an assembly line. Some people didn't have any sewing skill, they just came to help out with the cutting and packaging. Everyone was open and friendly and it was an great experience. At the close of the day I took Jean over to Patched Works and I'm pretty sure she liked it. Their selection is amazing. Even though Bigsby's is our sponsor, I have to admit, I like the fabric selection better on the next block. I did buy fabric from both stores though so it's all good. I finished 9 blocks using the herringbone tutorial. The problem I have now is that it uses up quite a bit of fabric so even though I have lots of pieces and strips left, none are long enough to make any more blocks. 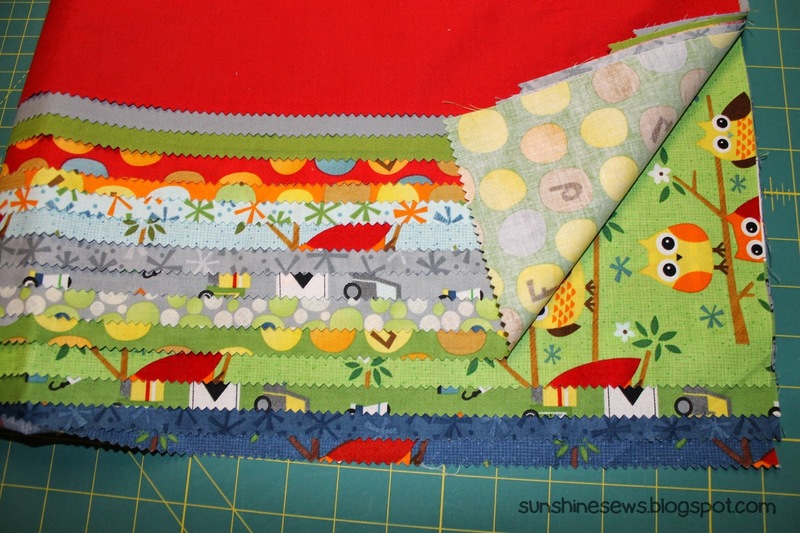 So that's it for the designer fat quarter bundle and that means this is all I'm doing. I did stop at the quilt shop and buy a larger piece of the owl print to use as backing and I bought some of the red print for the binding. I could piece the leftover strips together to make binding but I did that with my last few projects and I don't want to get complacent. Plus the design is busy enough. Now I have to decide what to do next. Do I sew them together just as they are or should I put some sashing strips in-between the squares to make each square stand out on its own? I think I will leave it up on the design board for a while and decide later. Here is my first square for the New Years' Sewalong. It's going to be a fun project with all these nice bright happy colors. I stitched this first block then went to move on to the next block. That's when I realized that I sewed the two outside edges together by mistake on that first block. I could have easily just turned the thing upside down but then the trucks and the owls would be upside down. I really want them all to go in the same direction (I think). Doesn't it look so much better sewn correctly?! I am going to join a sewalong. 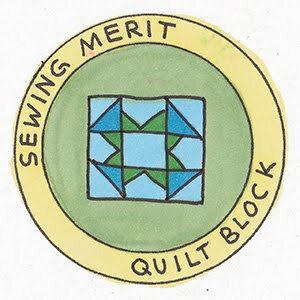 It's a little different than the quilt-alongs I've participated in. Although you can make a quilt, you can also make anything else you'd like from the quilt squares suring the sewalong. You can link to the sewalong here. All finished entries are eligible for a prize. The first instruction is to choose fabric and I think I am going to use the Designer bundle from Jenn Ski's 10 Little Things collection. I have some other fabrics I will audition, so maybe by next week I will change my mind. Or maybe make more than one thing. I guess I should start with the first square before deciding anything. I made this pouch for my phone from a tutorial by Amy Friend from During Quiet Time. The link to her tutorial is here. The pattern is called the iPhone Pouch but I enlarged it by a quarter-inch so it fit my Samsung Galaxy III. It fits quite perfectly in this little pouch. Amy's pattern calls for using hairband elastic when you want to add a button. I didn't have any and since it's under 20 degrees outside, I really didn't feel like leaving the house today to get some, so I used ribbon instead. I also added a lobster swivel clasp. It took me less than an hour to complete it. What a nice quick project!